On our first afternoon in Dunhuang we took a car ride to the north-west through the scrubby countryside of the Gobi Desert to the remains of Yumenguan (Jade Gate Pass) and the Great Wall which had been built 2100 years ago. The Han Dynasty (206 BC - 220 AD) Great wall 80 km north-west of Dunhuang. A program of Great Wall extensions was undertaken by the Han Dynasty commencing 120 BC. This was because the nomadic Xiongnu tribes to the north and west persisted in making frequent raids into Han areas causing widespread devastation. 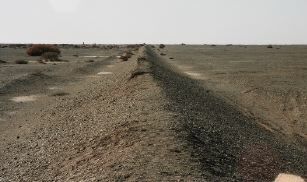 A Great Wall was built along the north of the narrow Gansu Corridor stretching 300 km from Jiayuguan in the east to Yumenguan and then as far west as Lop Nor, the salt lake on the edge of the Taklamakan Desert. The remains of a watch tower on the Great Wall with the Great Wall receding into the distance. Links to maps and a historical background about this region and Dunhuang are provided . Remains of the Great Wall, eroded by 2100 years of weathering, showing the method of construction. Built from local materials, it was constructed in layers using packed sandy soil mixed with reed stalks and tamarisk twigs (a local hardy bush). 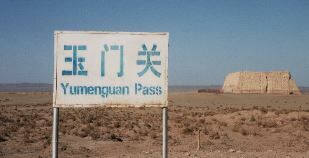 Yunmenguan Customs Gate (Jade Gate Pass). Yunmenguan was an armed fortified gate in the Great Wall which controlled the movement of traders and caravan trains along the Silk Road. 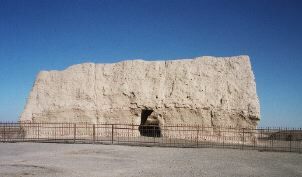 Today Yumenguan stands as an isolated ruin. In its day it was an armed fortified gate built into the Great Wall and was a strategic gateway controlling movement into Han territories. 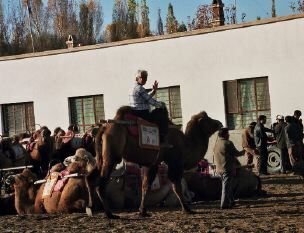 Traders and caravan trains passed through the gate on their journey along the Silk Road. Dunhuang is an oasis town on the edge of the Gobi Desert. 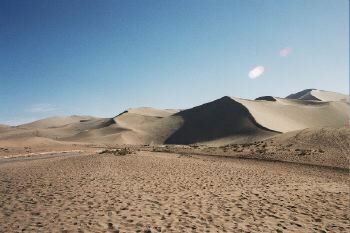 On Dunhuang's southern outskirts there is an extensive field of sand dunes which extends a substantial distance to the west. 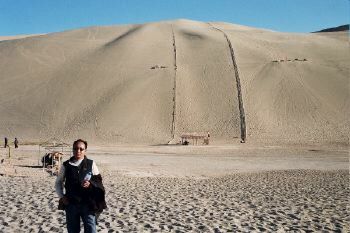 The 3500 feet high sand dunes on the souther outskirts of Dunhuang. Robert returns from a camel ride to the top of the dunes led by his camel handler. There are a large number of camels for hire at Dunhuang. Robert's interpreter and guide at Dunhuang.